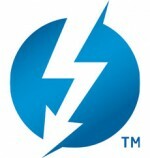 DigiTimes reports that Intel has notified partners that the company will “fully release” its Thunderbolt technology in April 2012. Intel is reportedly preparing to launch Thunderbolt-supported motherboards, notebooks and desktop PCs at that time. Intel and Apple originally partnered on the new technology which has become standard across Apple’s MacBook Pro, MacBook Air, Mac mini, and iMac. Digitimes reports that the cost of Thunderbolt technology is expected to drop in the second half of 2012, allowing more widespread adoption.While Apple does offer Thunderbolt across most of its product line, the first Thunderbolt products have been limited to relatively high end devices. More widespread adoption should help drive adoption by accessory makers that will benefit both Mac and PC users that use Thunderbolt. Intel has always said that they see both USB 3.0 and Thunderbolt as complementary technologies and plans to support both in their 2012 motherboards.